I am continuing to use Mrs. Wishy-Washy’s Farm as the basis of our creative writing class. 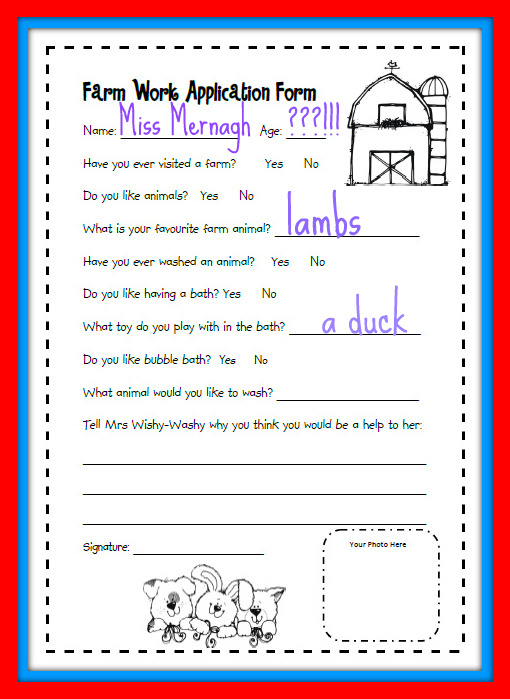 Yesterday we had lots of fun discussing and completing an application form to work with Mrs. Wishy-Washy’s herself! The application form a fantastic way to extend oral vocabulary, encouraged creative writing and to get children thinking and reasoning. Just a thought for those of you teaching ;). I hope that you enjoy this printable as much as we did.